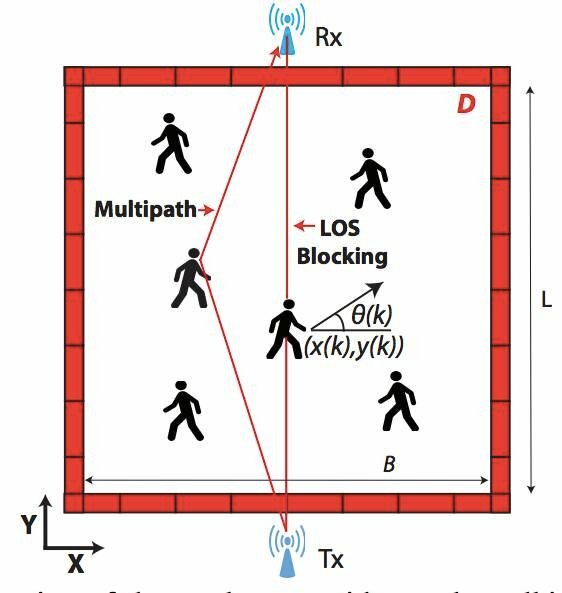 Video Wireless network gear can be used to estimate the number of people hidden behind walls, according to fresh research out of America. Saandeep Depatla, a PhD student, and Yasamin Mostofi, a professor of electrical and computer engineering, both at the University of California, Santa Barbara, were able to figure out more or less how many folks were in a room using Wi-Fi equipment. The duo used a bog-standard 2.4GHz wireless router as a transmitter at one end of a room, and a USB wireless card as a receiver at the opposite end hooked up to a non-Wi-Fi Raspberry Pi computer. The pair then measured the strength of signals from the transmitter to the receiver over time, as people in the space moved around, to work out how many bodies were present. When someone stepped directly between the transmitter and receiver, the strength of the Wi-Fi signal detected by the receiver dropped. The radio waves from the transmitter also reflected off people’s bodies wherever they stood, and interfered constructively and destructively, which caused the signal strength to increase or decrease depending on how the humans were positioned in the room. The system [paper PDF] then computed the slight changes in the Wi-Fi network strength over time into a guesstimate of the number of people in the room causing that radio signal disruption. During experiments, the team could detect up to 20 people walking casually in a room, with an error of two or fewer 100 per cent of the time. The error dropped to one person or zero 75 per cent of the time. Data was collected by the Raspberry Pi for about 300 seconds. The accuracy boiled down to the strength of the received Wi-Fi signals. The system struggled outdoors in open space, where reflections were much weaker. If the room is also cluttered, for example in a classroom settings with lots of tables and chairs, the signals can be noisy, making it difficult to discern individual people. The type of material present affects this technique, too: concrete blocks attenuated the signal a lot compared to wood. It’ll be a while before something like this is practical, but there are obvious areas where it would be useful. Wi-Fi base stations could be used in shops, offices, hotels, cafes, and so on, to work out how many people are present at a given moment of the day – which depressingly will be sold as data for advertising or something similar, we imagine. Alternatively, you could simply try to count the number of mobile phones in an area, to work out how many people are present, but this may pick up people outside. “Smart buildings can optimize the energy consumption based on the number of people in the building,” the pair's paper added. "Retails can better plan their business by assessing which parts of the store get more visitors. Smart cities can better plan the resources by estimating which areas of the city are more crowded." It’s not the first time Prof Mostofi has tinkered with Wi-Fi to peek behind walls. A similar experiment was performed last year, however, the Wi-Fi transmitter and receiver were tacked onto drones instead. “We have been using drones extensively in our imaging through walls project,” she told The Register. "They can certainly be used to hold the transmitter and receiver in this project, loiter for a bit, and once in a while move around to optimize their locations, as part of future work." Using drones could open the technology to military applications. Such a system could help armies scout out how many enemies or civilians were in a particular building before ordering drone strikes.